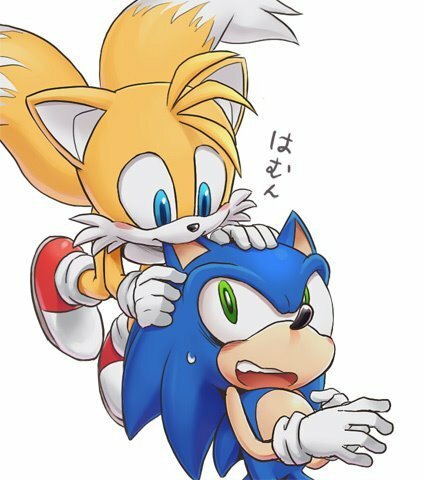 Tails bite Sonic's ear. Enjoy it and DON"T FORGET TO maoni :D. Wallpaper and background images in the Miles "Tails" Prower club tagged: tails sonic. me: hey tails duz his ear taste good? me: did sum1 put u up to dis? sonic: ok can u stop now? me: 'rofl' dat was funny! Sonic: Get of of me! Tails: I can't help it! Sonic: WELL GET THE F**K OFF OF ME! "AHHHHHHHHHHH! SOOO CUTTEEE! NOM ON HISH EAR!" What means that japanese words? Well,i think it means "What the...?" i think that you didn't draw this or even create it because i saw the same pic on Deviantart.com! sonic:GET THE CRAP OFF ME TAILS!!!!! Me:AWE THAT IS JUST SO ADORABLE! Sonic: OWWWWW TAILS WTF ARE U DOING. TAILS: UM Biting your ear. Awww that was so adorable.